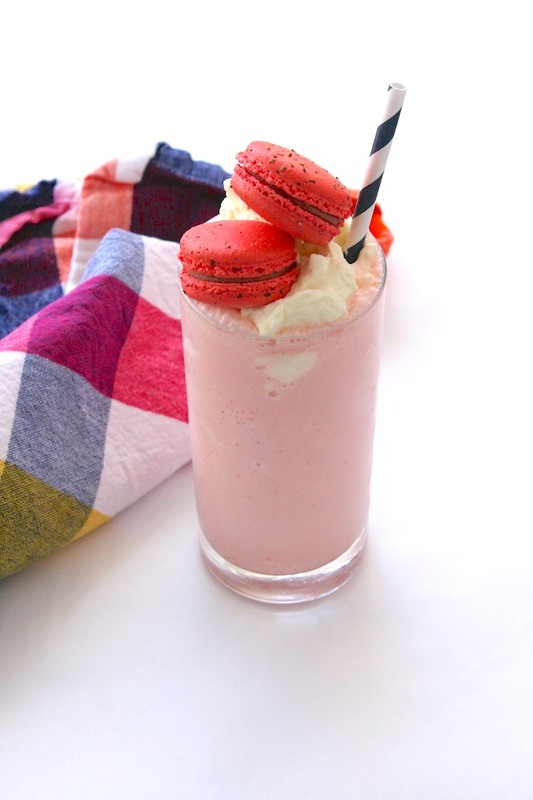 French Macaron Milkshake—My Latest Easy, Edible DIY on Refinery29! / Hey, EEP! French Macaron Milkshake—My Latest Easy, Edible DIY on Refinery29! Good morning! Happy Monday everyone. Did you have a lovely weekend? I tried my best not to think about Christmas cookies and spent time with friends eating Ukrainian dumplings (slash) drinking cold beer at the boardwalk in Brighton Beach, Brooklyn—so much fun! Put ice cream, milk and macarons in a blender and puree until smooth, adding more milk if needed. Divide among chilled glasses. Garnish with whipped cream and macarons, if desired. Is it sad I can't imagine myself giving up four of those babies to put in a drink? My favorite flavor is salted caramel, but I think the husband has a thing for the Rose ones from Macaron Bee in Georgetown. Which at first, you think taste like lotion, and then slowly realize it's a pretty hard flavor to pull off! Not at all! Actually, a lot of commenters on R29 said they wouldn't waste their macarons on a milkshake either, so maybe this wasn't the best idea—whoops. BIG fan of salted caramel. I totally get the lotion-y thing from Rose macarons too! I would use regular meringue though-especially if I had pavlova/schaum torte that was kind of ugly. You can actually use those cracked macaron shells. Absolutely @Kallie Huynh that's a great idea!! Yea, I wouldn't put my macarons in a milshake either, but with that said, this does look amazing. Love the Creativity and thats what matters most. I would have just separated the two recipes and told people to pair them together. Looks great.